A piece I did for The New York World on the New York City administration’s discriminatory policy towards Hispanic small business owners made it to NPR and HuffPost. When Celines De Leon-Veras decided to get her cleaning company certified under New York City’s program assisting minority businesses, she thought she would get easy access to winning city contracts. Instead, she found herself stumped by additional paperwork the city required her to provide to prove her Hispanic status. As part of the application, the city’s Department of Small Business Services asked the Leon-Veras, whose parents were born in the Dominican Republic, to furnish not just her birth certificate, but also a signed affidavit confirming her Hispanic identity. “It’s ridiculous that I needed an additional document to prove that I am eligible for the program as a Hispanic,” says Leon-Veras, who employs 120 people in her janitorial services business based in Washington Heights. Like Leon-Veras, all Latinos who apply for a certification under the city’s Minority and Women-owned Business Enterprise Program — known as M/WBE — have to provide an affidavit along with their application. None of the other ethnic groups the program serves, including Asians and blacks, must do the same. Created in 2005 under Local Law 129, the city’s small business program for minorities and women aims to promote “fairness and equity” in city procurement. The city sets goals for the share of government agency contracts that will go to black, Hispanic, Asian and female-run businesses, giving certified businesses a competitive edge in obtaining some government contracts. The city hasn’t always asked Hispanics to prove their heritage. It introduced the affidavit requirement only in 2010, in a bid to make it easier for Hispanic-run firms to qualify, according to a department spokesperson. 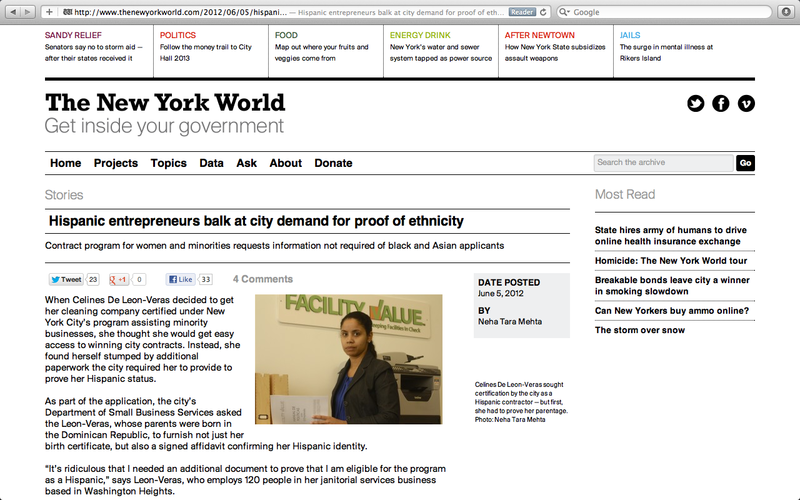 Quenia Abreu, president of the New York Women’s Chamber of Commerce, first noticed the new rules for Hispanics kick in when applications that her office had helped process were returned by the department of Small Business Services, with a request for birth certificates of the applicants’ parents or grandparents. At a March City Council hearing, Gregg Bishop, an Assistant Commissioner in the city’s department of Small Business Services, defended the city’s policy of singling out Hispanics for the affidavits. “Local Law 129 has a race and gender component to it, so that’s why we have this situation,” he said. Bishop said that under the law, the term “Hispanic” had been defined in a way that applicants whose parents originated from Spain or any other Spanish-speaking European country are not considered disadvantaged, and are thus ineligible for the program. Yet the state’s program for minority businesses does not ask Hispanic applicants to prove their ethnicity through an affidavit. “All ethnic groups applying for the Minority Business Enterprise or the Minority and Women-Owned Business Enterprise certification with New York State have uniform requirements for the documentation of their ethnic/racial group(s),” the Empire State Development said in an email statement. With its demand for an additional document, the city’s small business department is putting a “shadow of suspicion” on the entire community, says Peter Fontanes, chairman of New York Hispanics in Real Estate and Construction. “It is totally outrageous. We don’t understand the rationale of this provision,” he said. Abreu points that the city’s minority business program was designed to create equal opportunities and to be fair. “By singling out one group, there is a question of fairness,” she said. The gains for Hispanic-run businesses under the program have been small so far. In its latest M/WBE report to the City Council, the Mayor’s Office of Contract Services disclosed that in the second half of 2011, city agencies used goods or services under contract from 503 Hispanic-run firms under the program. But most of these were for “micro” contracts, valued at less than $5,000. Only five contracts larger than $100,000 were held by registered Hispanics. Hispanic-run firms also worked for the city on 92 subcontracts, totaling $14.3 million. The city spent a total of $15 billion on contracts last year. Some Hispanic business leaders say they have no objection to the affidavit requirement. Alfred P. Placeres, president of the New York State Federation of Hispanic Chambers of Commerce and advisory board member for the city’s M/WBE program, says that the affidavit helps prevent fraud.